Status: Paired with Gilbert in 2013 & 2014 and Timmy-Clef from 2015-2018. 2013: made a nest but no eggs produced. 2014: failed at egg stage (20 days incubation). 2015: failed at chick stage (22 days old). 2016: Made 2 nesting attempts, both failed at egg stage. 2017: Made 2 nesting attempts. The first was abandoned, the second successfully hatched and fledged 2 chicks. 2018: 2 attempts, 1st failed at egg stage, 2nd hatched 2 chicks, both failed to fledge. Summer 2010: Michaela is an attractive, large and non-aggressive female bird with a ranking somewhere in the middle of the release group. She has recently bonded well with Clarence and Gemma and is often seen alongside them. She is Gilbert's sister. September 2010: Michaela is still often found in a group with Clarence and Gemma, but this group has now expanded to include her brother Gilbert (Yellow-White-Red) and also Wendy (White-Blue-Red). 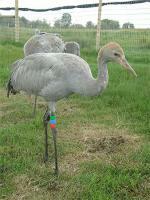 October 2010: Michaela is quite a quiet bird and is still keeping close to Clarence and Gemma. 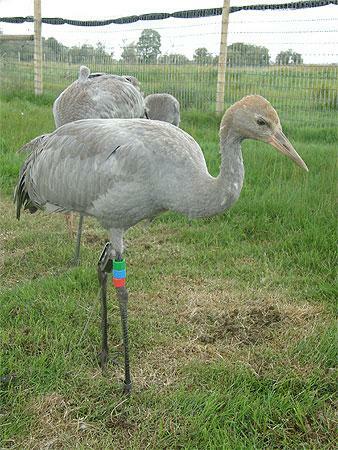 November 2010: In recent weeks Michaela has become part of a group of 20 as all the cranes have joined forces with Clarence’s group . They have found new fields to explore and are often found foraging in the maize stubble. January 2011: Michaela's white cheek patches seemed to appear almost overnight in early December - and we were amazed at the speed of the development of her adult plumage - way ahead of many of the others. She has been in with the whole body of birds which have largely acted as one through the coldest December on record. In mid December she developed a very strange walking habit of stretching her left leg out straight behind her every few steps. This does not seem to cause any problems walking or flying - but just looks very odd and we are keeping a close eye on her. March 2011: In early March Michaela was caught and her satellite tag removed as is could have been the cause of the odd walk. She was refitted with standard Black-Blue-Black UK code rings and a radio tag on her right leg. She quickly rejoined the rest of the flock, and her odd walking behaviour does seem to have settled down. Regarding her appearance, Michaela is by far the furthest ahead in the moulting race and is really starting to look like an adult crane. 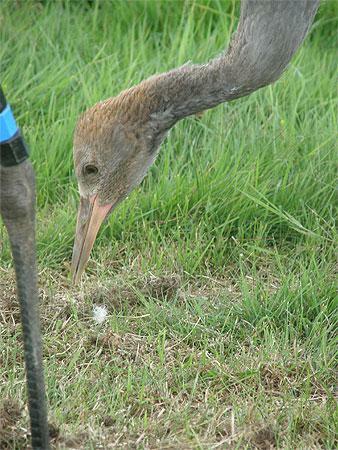 September 2011: Michaela now looks like an adult crane due to her sixe and that she has nearly all of her adult feathers and plumage. She is a stunning bird with a bold head-stripe and a large black bustle. She has responded well to the introduction of the 2011 youngsters, and has allowed them to be slowly integrated into the group. June 2012: Michaela has spent a quiet second winter on the Levels and Moors, very much as part of the group. No obvious pair-bonding behaviour has been observed yet. 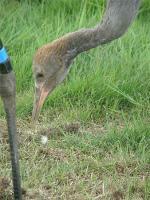 She was not part of the 'break-away' group that visited Slimbridge in Gloucestershire in early June. April 2013: Michaela appears to be building quite a strong bond with Gilbert - which is slightly alarming as Gilbert is her brother. The two birds have been seen displaying together, and leaving the main group and exploring the Levels and Moors a bit more than the others. May 2013: Michaela and Gilbert went on to make a nest on West Sedgemoor in Somerset, but sadly their efforts went no further than this, and an egg was not laid. January 2014: Michaela spent the rest of 2013 on the Somerset Levels with the main flock. The bond with Gilbert appears to have broken, possibly as Gilbert became quite badly affected by a swollen leg through the autumn. Fingers are crossed for Michaela pairing up again this Spring with another bird - hopefully not her brother this time! July 2014: From late February Michaela’s continued pairing with Gilbert became obvious again and the pair soon turned up on Westmoor. In the last days of April the pair were discovered incubating on West Sedgemoor. Sadly the two eggs were lost, at night (presumably to a night-time predator) on 14th May 2014 after 20 days incubation. Michaela continued to remain around the nest site area for the next few weeks and was seen alone at the end of June. July 2015: Michaela paired with Timmy-Clef, a 2011 release year male during the spring and the pair began incubation on West Sedgemoor in early April. 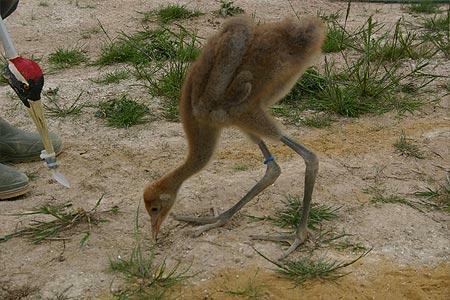 However, this nest was soon abandoned – possibly as it was very close or even within another pair of crane’s territory. They re-laid a double clutch and began incubation on 23rd April, but this nest suffered a partial predation by a crow, and then later abandonment of the remaining egg after 10 days. Amazingly Michaela then laid again and the nest was incubated through to hatching of a single chick on 13th June. Michaela and Timmy reared the chick for the following three weeks when it sadly disappeared sometime around July 4th/July5th. It is not known why the chick was lost. February 2016: Michaela spent the winter in Somerset and appears to still be bonded with Timmy - returning to their territory in mid January. Here's hoping for a successful outcome in 2016. July 2016: Back on its territory with Timmy from early in the New Year. Began incubation on West Sedgemoor in late March, but failed at egg stage. 2 nd attempt also on West Sedgemoor failed at hatching/just after hatch. Cause of loss unknown.Nov 2017: Back on her territory with Timmy on West Sedgemoor from early in the New Year. Began incubation in late March, but the nest was abandoned. 2nd attempt also on West Sedgemoor, hatched 2 chicks which have both been reared to fledging age. One of these chicks was caught, ringed (Red Black Green) and radio tagged on 17th July.Sept 2018: Back on her territory with Timmy on West Sedgemoor from early in the New Year. Began incubation on the first nest in early April, but the nest ended in failure. 2nd attempt hatched 2 chicks but one was lost early to an unknown cause, the other was ringed and radio tagged on 26th July and nicknamed Timitoo. On 6th August this juvenile was found dead. Date of death around 1st August – cause unknown and a mystery. It is not thought that the chick was predated.